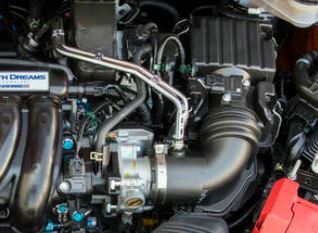 In this photo of the 2018 Fit engine, can somebody please identify the small hose just to the left of the throttle body, immediately before the MAP sensor? From right to left, we have: airbox, MAF sensor, intake pipe, PVC "clean side" breather tubes (the metal tubes), throttle body, "mystery hose", MAP sensor, and intake manifold. It goes to the purge valve for the evap system, which basically burns off gas fumes that form in the tank. colder a/c from hose insulation??? Quick Reply: What is this hose?